I don’t really know how it happened, but a few years ago I developed a keen interest in wine varietals and how they enhanced the flavor of food. Without a doubt, a fine wine makes food taste better. A good pairing will pull out the nuances and layers of flavor, which is why having a glass of wine with a meal has become so popular. 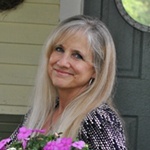 Today I’m sharing a couple of red and white wine pairings with selections from Sequoia Grove, a winemaker in the Napa Valley region. Let’s start with the white wine pairing. 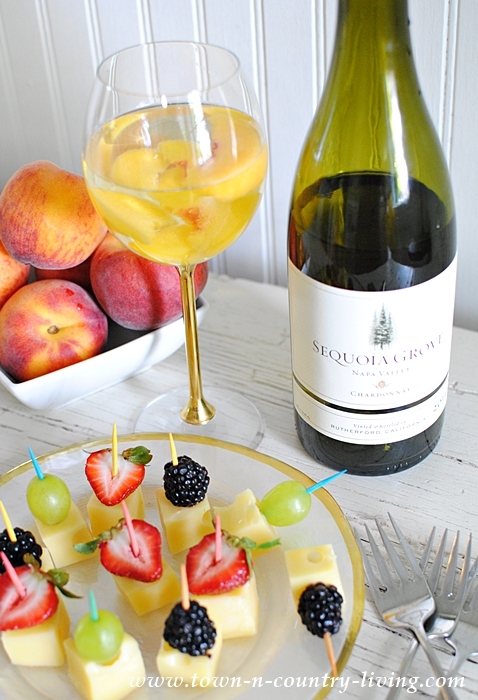 Chardonnay is one of my husband’s favorite wine choices and he loves it with cheese and fruit. 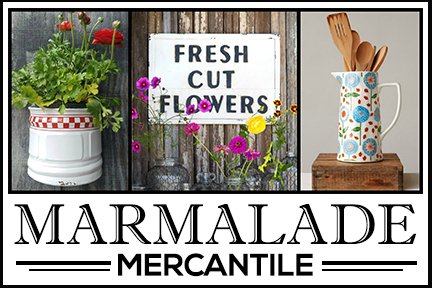 When entertaining, serve it with mini cheese and fruit skewers for a light and refreshing snack or appetizer. 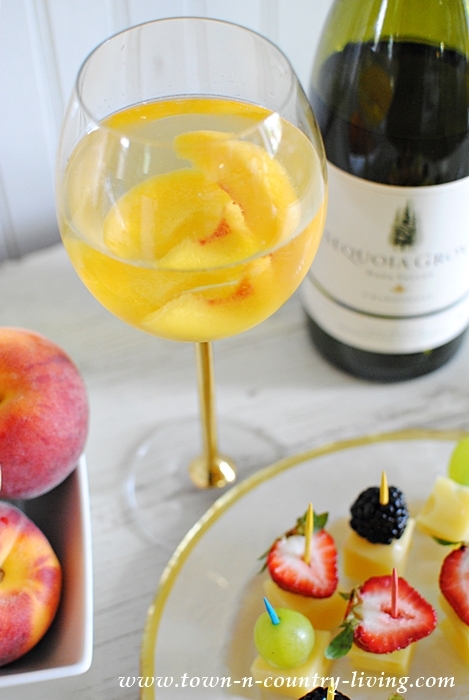 Here’s a favorite wine tip of mine: In the summer, add frozen fruit to white wine to keep it cooler, longer. 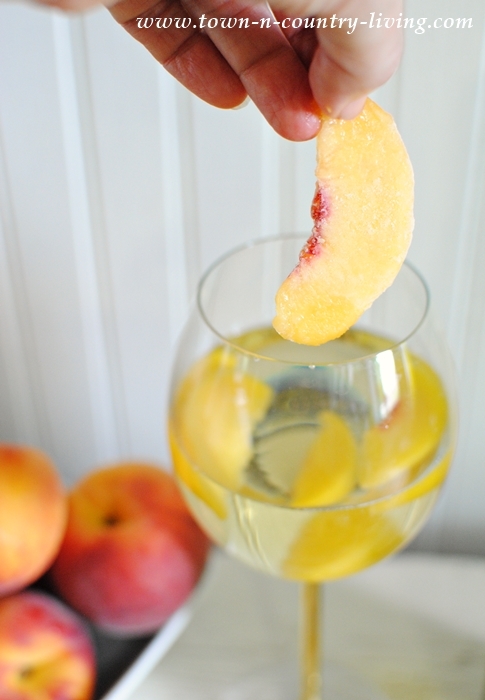 I opted for frozen peaches with Chardonnay. As the fruit starts to thaw, it releases its flavor into the wine. Not only that, but the fruit looks pretty swirling around in the wine glass. 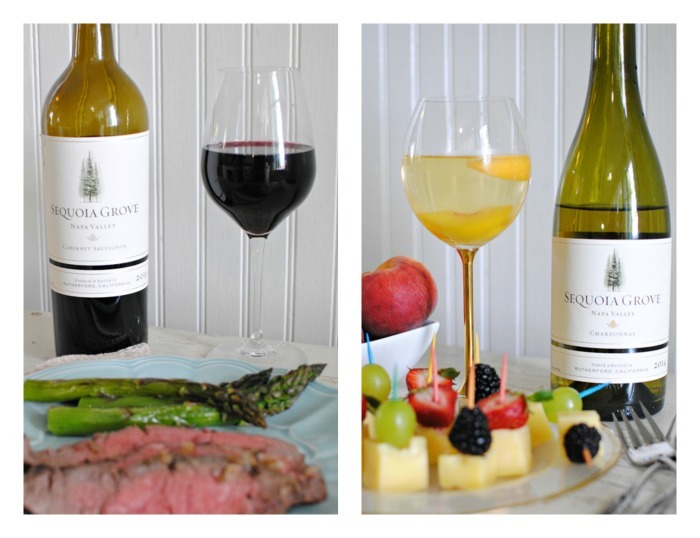 I tend to favor wines from the Napa region, and Sequoia Grove is a special gem in the valley. In the midst of 18 acres of vineyards, their tasting room is tucked inside a barn with more than 100 years of Rutherford history. One day I plan to visit the Napa Valley and Sequoia Grove is on my list of vineyards to see. 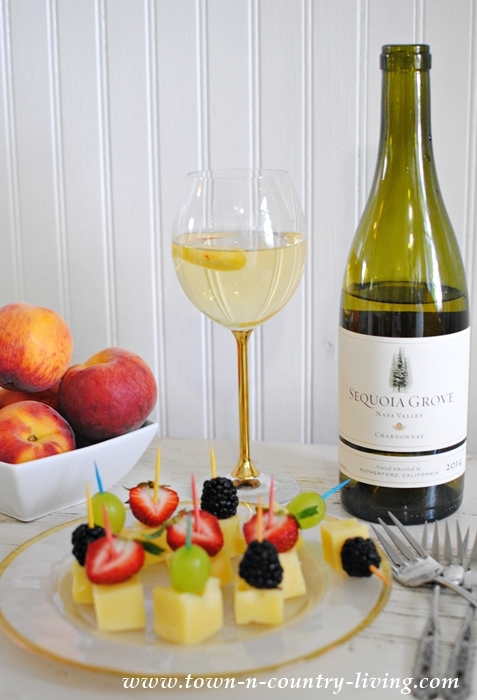 Sequoia Grove’s Chardonnay presents notes of pear, lychee, citrus zest, lightly toasted almonds, and fresh bread. Sounds perfect, doesn’t it? 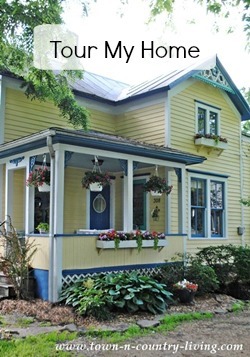 If you enjoy Chardonnay, this wine doesn’t disappoint! Next up is a red wine pairing along with one of my favorite recipes! 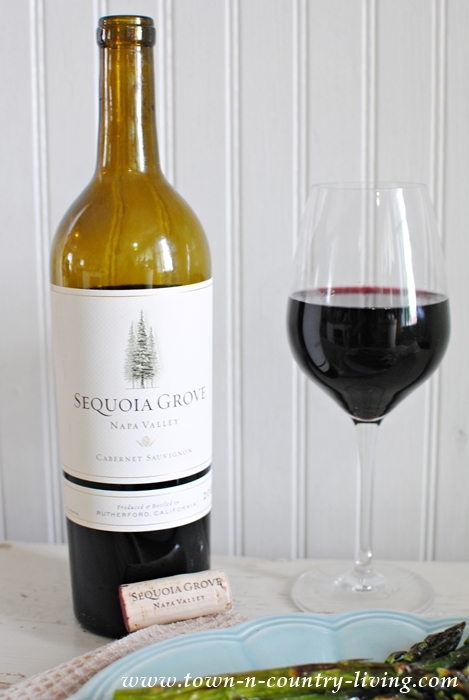 Sequoia Grove’s Cabernet Sauvignon is dark red in color with aromas of raspberries and warm baking spices. 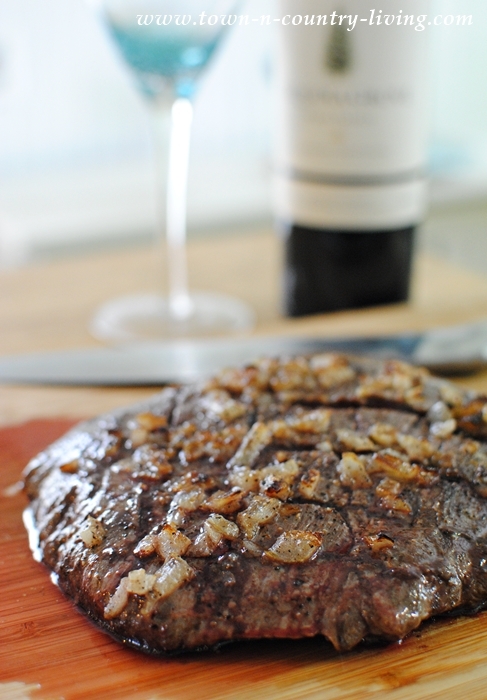 A full-bodied wine like this is perfectly paired with red meat. 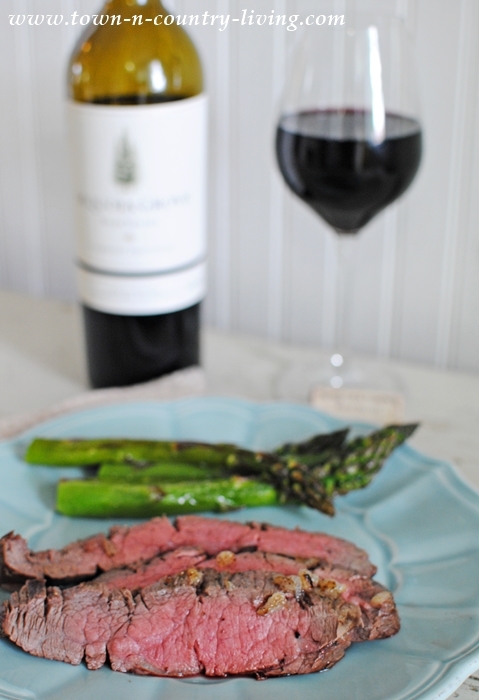 I served it with London Broil, which is super easy to make. I use flank steak for my London Broil. Since it can be a little tough, you want to score the meat in a criss-cross pattern. I like to soften sweet onions in olive oil over the stove on low heat, and then spread them across the meat along with the oil. Add a generous shaking of fresh ground black pepper. Grill the flank steak for 5 minutes on each side for a medium-rare finish. In the summer, you can grill the meat outdoors, but in winter I simply place it under the oven broiler. 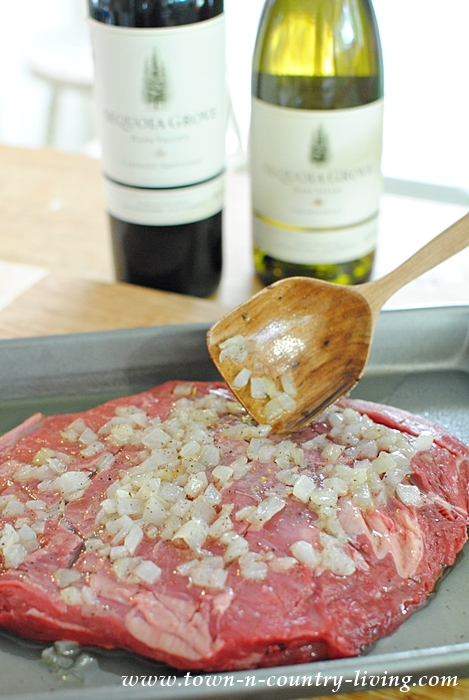 Cut the meat in thin slices at an angle before serving. I don’t eat meat anymore but my family loves this steak. For my vegetarian meals, I’ll typically pair a full-bodied red wine like a Cabernet Sauvignon with a hearty mushroom dish like mushroom souffle or mushroom ragout. Which do you prefer when it comes to red and white wine pairings? Are you more of a red wine or a white wine aficionado? And for the record, I loved both these wines from Sequoia Grove! 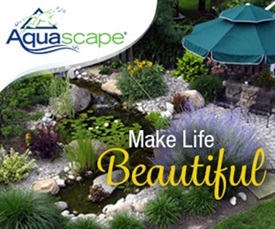 This post was sponsored on behalf of Sequoia Grove via One2One Network. All opinions stated are my own. I enjoy both red and white. However I tend to go for red more in winter and white in summer. Could be because our meals are heartier in the winter and lighter in the summer. Thanks for the idea of frozen fruit in my Chardonnay. Can’t wait to try that.